Photo: Robinson Mansion, ca. 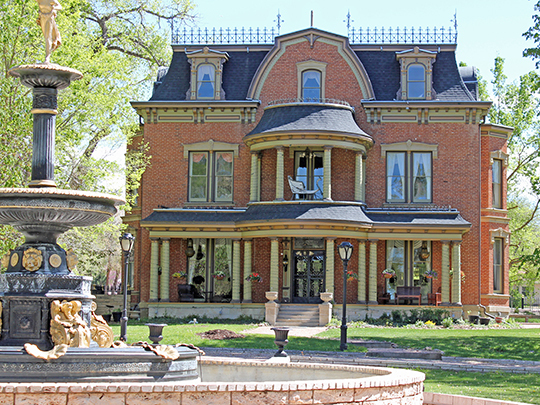 1886, 12 Riverside Drive, Canyon City, CO. Listed on the National Register of Historic Places in 1984. Photographed by user:Jeffrey Beall (own work), 2012, [cc-by-3.0 (creativecommons.org/licenses/by/3.0)], via Wikimedia Commons, accessed June, 2015. The Fremont County Courthouse is located a6 615 Macon Avenue, Canon City CO 81212; phone: 719-276-7300. Between 1540 and 1848, what is now Fremont County was an area subject to various land disputes among Spain, France, Mexico, the Republic of Texas, and the United States. Trappers, traders, and mountain men came to stake their own claims in the Arkansas Valley in the early 1800s. Indeed, the County is named after Colonel John C. Fremont, known as "The Pathfinder." The Pikes Peak Gold Rush in 1859 brought more residents, resulting in the settlement of Canon City, Florence, and the Hardscrabble area. Early in 1860 the first mining claim for coal was filed for in Fremont County near what is now known as Coal Creek. Shortly after an "oil seep" was discovered, oil production began in Fremont County. Since these early finds, mining for iron, gypsum, marble, limestone, and granite also have taken place; and the current mining boom of aggregates has been thriving for several years. In 1861, Fremont County became one of the original seventeen counties created by the Colorado Territorial Legislature, with Canon City as the County seat. Throughout its history, the County has attracted growth with its mild climate, rich soils, available water supply, abundant mineral resources, and outstanding natural beauty. Fremont County Colorado Commissioners and Staff, Fremont County Master Plan, 2015 update, www.fremontco.com, accessed November, 2015.